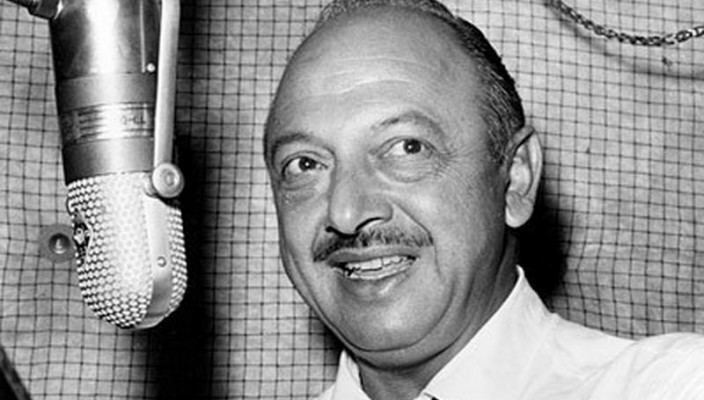 Born May 30, 1908 (1908-05-30) San Francisco, California, U.S.
Other names "The Man of 1000 Voices"
Melvin Jerome "Mel" Blanc (May 30, 1908 – July 10, 1989) was an American voice actor, actor, radio comedian, and recording artist. He began his 60-plus-year career performing in radio, but is best remembered for his work in animation as the voices of Bugs Bunny, Daffy Duck, Porky Pig, Tweety Bird, Sylvester the Cat, Yosemite Sam, Foghorn Leghorn, Marvin the Martian, Pepé Le Pew, Speedy Gonzales, Wile E. Coyote, Road Runner, the Tasmanian Devil, and many of the other characters from the Looney Tunes and Merrie Melodies theatrical cartoons during the golden age of American animation. 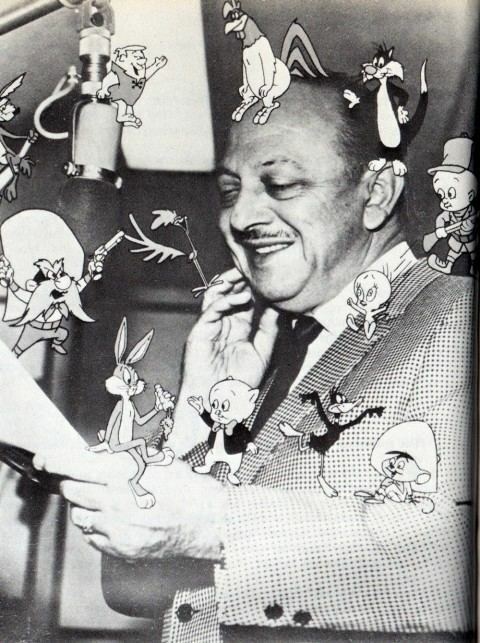 He was, in fact, the voice for all of the major male Warner Bros. cartoon characters except for Elmer Fudd, whose voice was provided (uncredited) by fellow radio actor Arthur Q. Bryan, although Blanc later voiced Fudd as well after Bryan's death. He later worked for Hanna-Barbera's television cartoons, most notably as the voices of Barney Rubble on The Flintstones and Mr. Spacely on The Jetsons. Blanc was also the original voice of Woody Woodpecker for Universal Pictures, and provided vocal effects for the Tom and Jerry cartoons directed by Chuck Jones for MGM. Furthermore, during the golden age of radio, Blanc was a frequent performer on the radio programs of famous comedians from the era, including Jack Benny, Abbott and Costello, Burns and Allen, and Judy Canova. Having earned the nickname "The Man of a Thousand Voices", Blanc is regarded as one of the most influential people in the voice-acting industry. Blanc was born in San Francisco, California to Russian-Jewish parents Frederick and Eva Blank, the younger of two children. He grew up in the neighborhood of Western Addition in San Francisco, and later in Portland, Oregon where he attended Lincoln High School. Growing up, he had a fondness for voices and dialect which he began voicing at the age of 10. He claimed that he changed the spelling of his name when he was 16, from "Blank" to "Blanc", because a teacher told him that he would amount to nothing and be like his name, a "blank". Blanc joined the Order of DeMolay as a young man, and was eventually inducted into its Hall of Fame. After graduating from high school in 1927, he split his time between leading an orchestra, becoming the youngest conductor in the country at the age of 19, and performing shtick in vaudeville shows around Washington, Oregon, and northern California. Blanc began his radio career at the age of 19 in 1927, when he made his acting debut on the KGW program The Hoot Owls, where his ability to provide voices for multiple characters first attracted attention. He moved to Los Angeles in 1932, where he met Estelle Rosenbaum (1909–2003), whom he married a year later, before returning to Portland. He moved to KEX in 1933 to produce and co-host his Cobweb and Nuts show with his wife Estelle, which debuted on June 15. The program played Monday through Saturday from 11:00 pm to midnight, and by the time the show ended two years later, it appeared from 10:30 pm to 11:00 pm. With his wife's encouragement, Blanc returned to Los Angeles and joined Warner Bros.–owned KFWB in Hollywood in 1935. He joined The Johnny Murray Show, but the following year switched to CBS Radio and The Joe Penner Show. Blanc was a regular on the NBC Red Network show The Jack Benny Program in various roles, including voicing Benny's Maxwell automobile (in desperate need of a tune-up), violin teacher Professor LeBlanc, Polly the Parrot, Benny's pet polar bear Carmichael, the tormented department store clerk, and the train announcer. The first role came from a mishap when the recording of the automobile's sounds failed to play on cue, prompting Blanc to take the microphone and improvise the sounds himself. The audience reacted so positively that Benny decided to dispense with the recording altogether and have Blanc continue in that role. 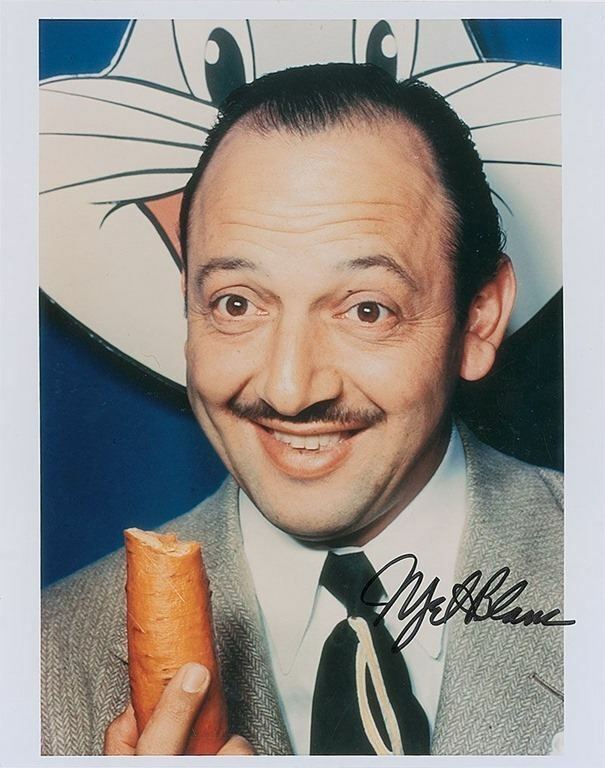 One of Blanc's most memorable characters from Benny's radio (and later TV) programs was "Sy, the Little Mexican", who spoke one word at a time. The famous "Sí ... Sy ... Sue ... sew" routine was so effective that no matter how many times it was performed, the laughter was always there, thanks to the comedic timing of Blanc and Benny. Blanc continued to work with him on radio until the series ended in 1955 and followed the program into television from Benny's 1950 debut episode through guest spots on NBC specials in the 1970s. They last appeared together on a Johnny Carson Tonight Show in January 1974. A few months later, Blanc spoke highly of Benny on a Tom Snyder Tomorrow show special aired the night of the comedian's death. By 1946, Blanc appeared on over 15 radio programs in supporting roles. 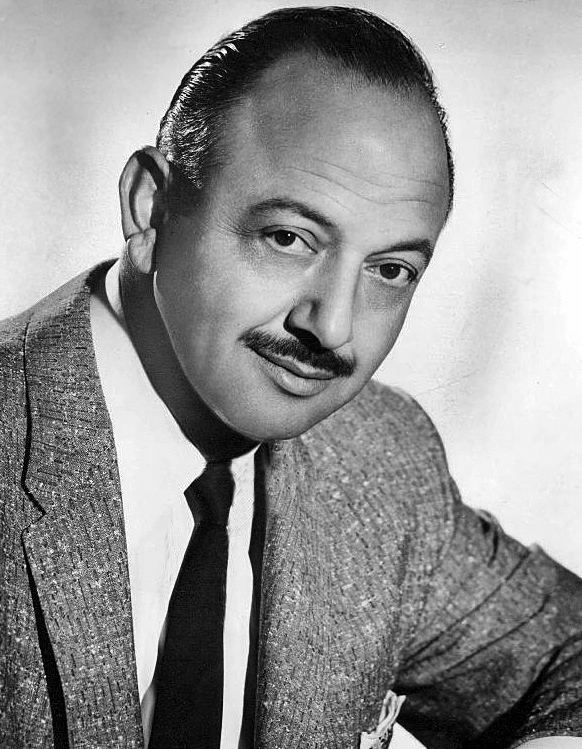 His success on The Jack Benny Program led to his own radio show on the CBS Radio Network, The Mel Blanc Show, which ran from September 3, 1946, to June 24, 1947. Blanc played himself as the hapless owner of a fix-it shop, as well as his young cousin Zookie. Blanc also appeared on such other national radio programs as The Abbott and Costello Show, the Happy Postman on Burns and Allen, and as August Moon on Point Sublime. During World War II, he appeared as Private Sad Sack on various radio shows, most notably G.I. Journal. Blanc recorded a song titled "Big Bear Lake". 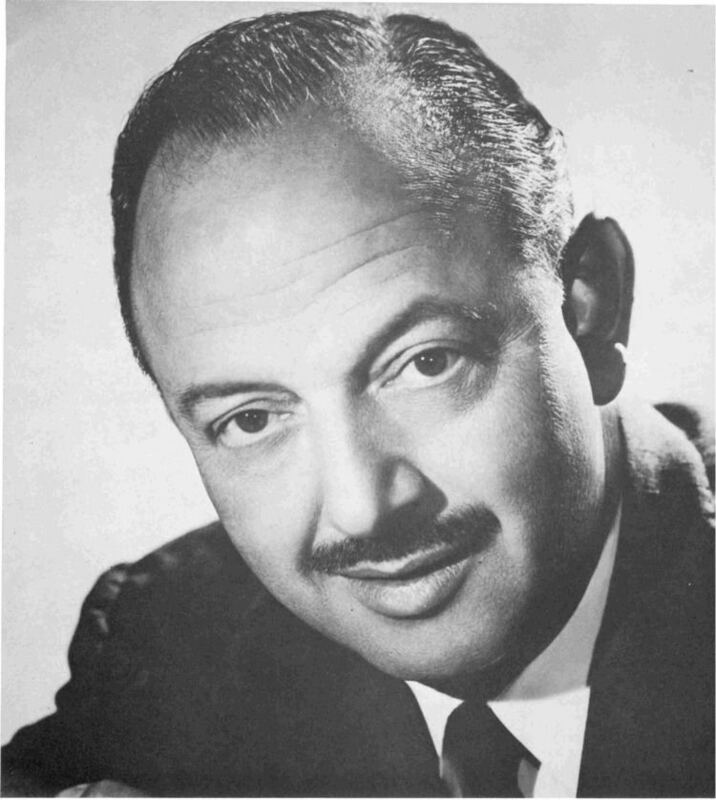 In December 1936, Mel Blanc joined Leon Schlesinger Productions, which was producing theatrical cartoon shorts for Warner Bros. After sound man Treg Brown was put in charge of cartoon voices, and Carl Stalling became music director, Brown introduced Blanc to animation directors Tex Avery, Bob Clampett, Friz Freleng, and Frank Tashlin, who loved his voices. The first cartoon Blanc worked on was Picador Porky (1937) as the voice of a drunken bull. He soon after received his first starring role when he replaced Joe Dougherty as Porky Pig's voice in Porky's Duck Hunt, which marked the debut of Daffy Duck, also voiced by Blanc. Following this, Blanc became a very prominent vocal artist for Warner Bros., voicing a wide variety of the "Looney Tunes" characters. Bugs Bunny, whom Blanc made his debut as in A Wild Hare (1940), was known for eating carrots frequently (especially while saying his catchphrase "Eh, what's up, doc?"). To follow this sound with the animated voice, Blanc would bite into a carrot and then quickly spit into a spittoon. One oft-repeated story is that Blanc was allergic to carrots, which Blanc denied. In Disney's Pinocchio, Blanc was hired to perform the voice of Gideon the Cat. However, Gideon eventually was decided to be a mute character (similar to Dopey from Snow White and the Seven Dwarfs), so all of Blanc's recorded dialogue was deleted except for a solitary hiccup, which was heard three times in the finished film. Blanc also originated the voice (and laugh) of Woody Woodpecker for the theatrical cartoons produced by Walter Lantz for Universal Pictures, but stopped voicing the character after he was signed to an exclusive contract with Warner Bros. During World War II, Blanc served as the voice of the hapless Private Snafu in various war-themed animated shorts. Throughout his career, Blanc, aware of his talents, protected the rights to his voice characterizations contractually and legally. He, and later his estate, never hesitated taking civil action when those rights were violated. 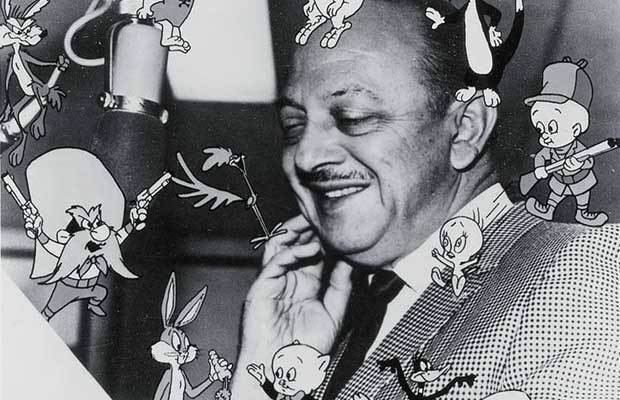 Voice actors at the time rarely received screen credits, but Blanc was a notable exception; by 1944, his contract with Warner Bros. stipulated a credit reading "Voice characterization(s) by Mel Blanc." According to his autobiography, Blanc asked for and received this screen credit from studio boss Leon Schlesinger after he was denied a salary raise. Initially, Blanc's screen credit was limited only to cartoons where he voiced Bugs Bunny, with any other shorts he worked on being uncredited. In the middle of 1945, the contract was amended to include a screen credit for cartoons featuring Porky Pig and/or Daffy Duck as well, save for any shorts made before that amendment occurred (Book Revue and Baby Bottleneck are examples, despite being released after the fact). But by the end of 1946, Blanc began receiving a screen credit in any subsequent Warner Bros. cartoon he provided voices from that point on. In 1960, after the expiration of his exclusive contract with Warner Bros., Blanc continued working for WB, but also began providing voices for the TV cartoons produced by Hanna-Barbera; his most famous roles during this time were Barney Rubble of The Flintstones and Cosmo Spacely of The Jetsons. His other notable voice roles for Hanna-Barbara included Dino the Dinosaur, Secret Squirrel, Speed Buggy, and Captain Caveman, as well as voices for Wally Gator and The Perils of Penelope Pitstop. Blanc also worked with former "Looney Tunes" director Chuck Jones, who by this time was directing shorts with his own company Sib Tower 12 (later MGM Animation/Visual Arts); doing vocal effects for the Tom and Jerry series from 1963 to 1967. Blanc was the first voice of Toucan Sam in Froot Loops commercials. Blanc reprised some of his Warner Bros. characters when the studio contracted him to make new theatrical cartoons in the mid-to-late 1960s. For these, Blanc voiced Daffy Duck and Speedy Gonzales, the characters who received the most frequent use in these shorts (later, newly introduced characters such as Cool Cat and Merlin the Magic Mouse were voiced by Larry Storch). 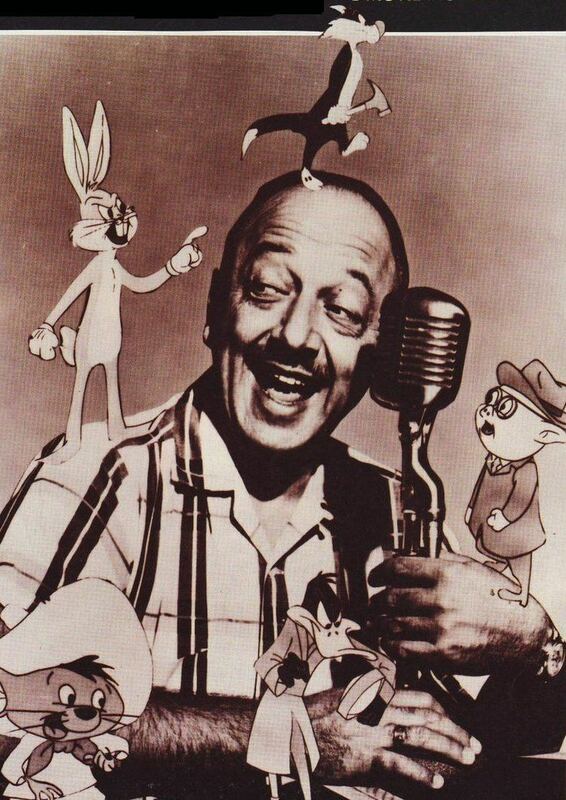 Blanc also continued to voice the "Looney Tunes" for the bridging sequences of The Bugs Bunny Show, as well as in numerous animated advertisements and several compilation features, such as The Bugs Bunny/Road Runner Movie (1979). On January 24, 1961, Blanc was involved in a near-fatal car accident. He was driving alone when his sports car collided head-on with a car driven by 18-year-old college student Arthur Rolston on Sunset Boulevard. Rolston suffered minor injuries, but Blanc was rushed to the UCLA Medical Center with a triple skull fracture that left him in a coma for two weeks, along with sustaining fractures to both legs and the pelvis. About two weeks after the accident, one of Blanc's neurologists tried a different approach. Blanc was asked, "How are you feeling today, Bugs Bunny?" After a slight pause, Blanc answered, in a weak voice, "Eh... just fine, Doc. How are you?" The doctor then asked Tweety if he was there, too. "I tot I taw a puddy tat," was the reply. Blanc returned home on March 17. Four days later, Blanc filed a US$500,000 lawsuit against the city of Los Angeles. His accident, one of 26 in the preceding two years at the intersection known as Dead Man's Curve, resulted in the city funding the restructuring of curves at the location. Years later, Blanc revealed that during his recovery, his son Noel "ghosted" several Warner Bros. cartoons' voice tracks for him. Warner Bros. had also asked Stan Freberg to provide the voice for Bugs Bunny, but Freberg declined, out of respect for Blanc. At the time of the accident, Blanc was also serving as the voice of Barney Rubble in The Flintstones. His absence from the show was relatively brief; Daws Butler provided the voice of Barney for a few episodes, after which the show's producers set up recording equipment in Blanc's hospital room and later at his home to allow him to work from there. Some of the recordings were made while he was in full-body cast as he lay flat on his back with the other Flintstones co-stars gathered around him. He also returned to The Jack Benny Program to film the program's 1961 Christmas show, moving around by crutches and a wheelchair. In the 1970s, Blanc gave a series of college lectures across the US and appeared in commercials for American Express. He also collaborated on a special with the Boston-based Shriners Burns Institute called Ounce of Prevention, which became a 30-minute TV special. Throughout the 1980s, Blanc performed his Looney Tunes characters for bridging sequences in various compilation films of Golden-Age-era Warner Bros. cartoons, such as The Looney Looney Looney Bugs Bunny Movie, Bugs Bunny's 3rd Movie: 1001 Rabbit Tales, Daffy Duck's Fantastic Island, and Daffy Duck's Quackbusters. His final performance of his "Looney Tunes" roles was in Bugs Bunny's Wild World of Sports (1989). After spending most of two seasons voicing the diminutive robot Twiki in Buck Rogers in the 25th Century, Blanc's last original character was Heathcliff, in the early 1980s. In the 1983 live-action film Strange Brew, Blanc voiced the father of Bob and Doug MacKenzie, at the request of comedian Rick Moranis. In the 1988 live-action/animated movie Who Framed Roger Rabbit, Blanc reprised several of his classic "Looney Tunes" roles (Bugs, Daffy, Porky, Tweety, and Sylvester), but left Yosemite Sam to Joe Alaskey (who later became one of Blanc's regular replacements until his death in 2016). As Disney produced the film, the company had to obtain permission from Warner Bros. and other studios in order to feature the non-Disney characters in the movie. The film was also notably the only other Disney film Blanc was involved in after Pinocchio more than 45 years prior. Blanc died just a year after the film's release. His final recording session was for Jetsons: The Movie (1990). Blanc began smoking cigarettes when he was nine years old. He continued his pack-a-day habit until he was diagnosed with emphysema, which pushed him to quit at age 77. On May 19, 1989, Blanc was checked into Cedars-Sinai Medical Center by his family when they noticed he had a bad cough while shooting a commercial; he was originally expected to recover. Blanc's health then took a turn for the worse and doctors found that he had advanced coronary artery disease. He died on July 10 at Cedars-Sinai Medical Center in Los Angeles, at the age of 81. He is interred in the Hollywood Forever Cemetery in Hollywood. Blanc's will stated his desire to have the inscription on his gravestone read, "THAT'S ALL FOLKS" (the phrase was a trademark of Blanc's character Porky Pig). Blanc is regarded as the most prolific voice actor in the history of the industry. He was the first voice actor to receive on-screen credit. Blanc's death was considered a significant loss to the cartoon industry because of his skill, expressive range, and sheer volume of continuing characters he portrayed, which are currently taken up by several other voice talents. Indeed, as movie critic Leonard Maltin once pointed out, "It is astounding to realize that Tweety Bird and Yosemite Sam are the same man!" According to Blanc, Sylvester the Cat was the easiest character to voice because "It's just my normal speaking voice with a spray at the end." Yosemite Sam was the hardest because of his loudness and raspiness. A doctor who once examined Blanc's throat found that he possessed unusually thick, powerful vocal cords that gave him an exceptional range. The doctor reported that they rivaled those of famed opera singer Enrico Caruso. After his death, Blanc's voice continued to be heard in newly released productions, such as recordings of Dino the Dinosaur in the live-action films The Flintstones (1994) and The Flintstones in Viva Rock Vegas (2000). Similarly, recordings of Blanc as Jack Benny's Maxwell were featured in Looney Tunes: Back in Action (2003). More recently, archive recordings of Blanc have been featured in new CGI-animated "Looney Tunes" theatrical shorts; I Tawt I Taw a Puddy Tat (shown with Happy Feet Two) and Daffy's Rhapsody (shown with Journey 2: The Mysterious Island). Blanc trained his son Noel in the field of voice characterization. Although the younger Blanc has performed his father's characters (particularly Porky Pig) on some programs, he has chosen not to become a full-time voice artist. For his contributions to the radio industry, Mel Blanc has a star on the Hollywood Walk of Fame at 6385 Hollywood Boulevard. His character Bugs Bunny also has a star on the Hollywood Walk of Fame (the only others to have received this honor are Walt Disney as both himself and Mickey Mouse, Jim Henson as both himself and Kermit the Frog, and Mike Myers as both himself and Shrek).